State of the Union - The Musical! Welcome to the Dividist's annual coverage of the Presidential Address to Congress - aka State of the Union - The Musical! In 2007, as a blogging toddler, the Dividist despaired at finding a unique approach to the SOTU when so many other bloggers would be traversing the same ground. The answer came from Bob Woodward. In an on-line Washington Post forum the Dividist asked whether the SOTU had any real relevance. Woodward responded by saying it was "mostly theater." Genius. That was the answer. What better way to frame the SOTU, media and blog reactions than within the lyrics of a Broadway show tune? The game is to start with a Broadway song then find blog posts, news stories, tweets, essays and commentary that can be vaguely referenced in the song and link them to the lyrics. It keeps the Dividist awake and blogging throughout the speech and mandatory drinking game. In 2007 it was "Comedy Tonight" from A Funny Thing Happened on the Way to the Forum. In 2008 it was the 1966 hit "Georgy Girl Boy". For 2009, we welcomed President Obama with "Razzle Dazzle" from the musical Chicago. In 2010, the man behind the curtain was revealed in - The Wizard of Oz. We mostly skipped 2011, but in 2012, with the President and Congress erecting barricades against mobs wielding pitchforks and torches, we were drawn to Les Miserables and "Do you hear the people sing?" In 2013, after the people handed the President an overwhelming 52% mandate for absolutely no change, we offered a tribute to our prog friends as they gaze lovingly at President Obama Superstar and thought "I don't know how to love him". In 2014, although an election year, we were virtually assured of continuing our happily divided government for the balance of his administration, so the President declared he will rule with a pen and a phone. It sounded like he was going to mail it in for balance of the second term. What could be more appropriate than President Obama gazing in a mirror and singing "I believe in you" from "How to Succeed as President Without Really Trying". An now, here we are in 2015, with not just any divided government, but the very best kind of divided government. 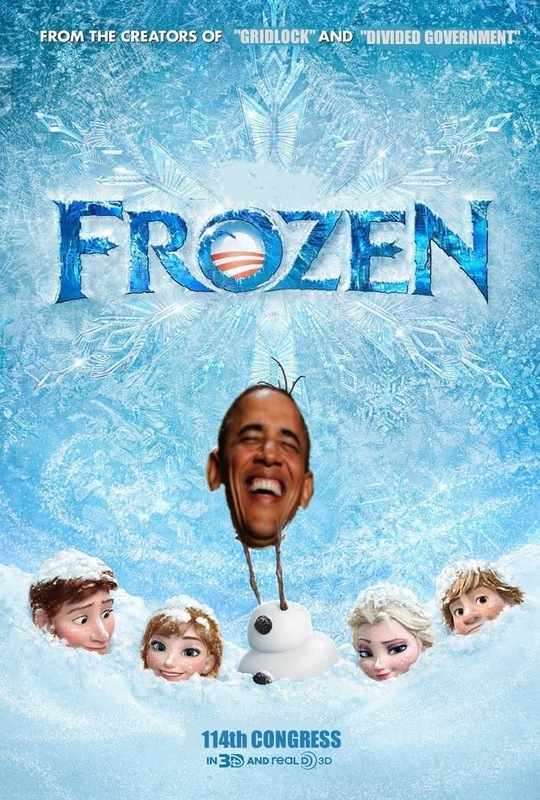 With fears of a lame duck President locked into a frozen block of icy gridlock with a Republican Congress, what could be more appropriate for the State of the Union than President Obama choosing to empower himself with "Let It Go" from Frozen? "Who's super powerful, can totally get down with their own company, and has the ability to freeze their opponents in their tracks? If you're thinking Elsa from Frozen, then you're totally right. But if you're thinking this description also fits the Republicans in the 114th Congress, well, you're totally right, too. The 114th Congress commences today, and aside from a few details, the Senate and House of Representatives' futures look a lot like Frozen's plot. Does two sisters struggling to love each other and keep their kingdom from freezing over sound familiar? Yeah, we thought so..."
Thanks Jenn. We'll post the lyrics now then update with links to live-bloggers, pundits, twitteratti, analysts and reporters before, during and after the speech. It'll be over when we get tired of the speech or too drunk to type. The Dividist welcomes any and all suggested links, in comments or twitter, for any and all lines anywhere in the lyrics, from any who accidentally stumble across this post, at any time. Can't get to me at all! No right, no wrong, no rules for me I'm free! That perfect man is gone! Added more links on the morning after. Note To Self: Next year pick a song with shorter lyrics.